The GISNY 2019 Book Fair is scheduled for March 4 - 8. Students and parents will have an amazing opportunity to visit the fair and purchase new books from a collection selected for our school. 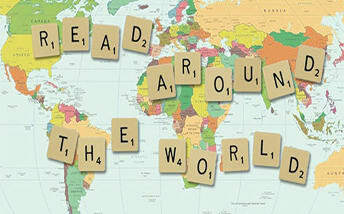 This year's theme is "Read Around the World". Have you bought your tickets yet? Don't miss out on the most fabulous event of the year by leaving it too late! Tickets are limited. 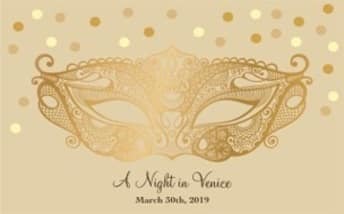 Visit our website GALA 2019 or use the form included with your invitation. For those who prefer to pay in person, the Gala Committee will be selling tickets at school every Friday afternoon from 1:30 pm - 2:30 pm, while tickets last. 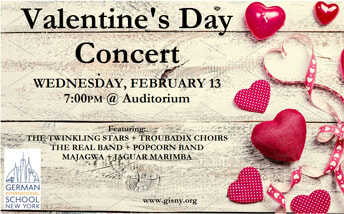 We will also be selling tickets at the upcoming Winter Concert on Feb. 13th. The Gala team is requesting your help in soliciting prizes for our upcoming fundraising auctions; asking you to go out and ask people to donate to our school's fundraiser. It could be your hairdresser, favorite restaurant, karate instructor, sports club, wine shop, your boss, your family, your neighbors, and any other person you talk to on a regular basis. Yeah, right. Easier said then done. To many of us in our school's community this seemingly simple request really takes us out of our comfort zone. We may feel awkward, unsure what to say or do, embarrassed, as this just does not come natural. I have been there. When I was asked to take over the coordination of the raffle 4 years ago, I felt all of the above emotions. Even now, in my second year on the Gala Committee, I have to force myself to get out there. I get it. Luckily, Americans are very familiar with this concept of school fundraising. Companies are aware of the advertising benefits to their business, they want to support their patrons/customers as well as their local community. This is all bread and butter to them. Which makes it so much easier to walk in and say: "Good morning, my kids' school is organizing a fundraiser on March 30th. They go to the German International School in White Plains. Would you consider making a donation?" No one is offended or surprised by your request. Often, the manager will immediately request "paper work", scan through our letter, ask a question or two about our school and offer a gift certificate. Other times, the staff may take our letter and inform you that they will speak to the owner or manager. You can remind them that our contact details are on the letter and they can contact us anytime for further questions or to request a pick up of their donation. If you know the person well, you may be able to coax them into giving more generously, better than anyone else! So what are you waiting for? Support our school, pick up a few donation forms at the front office, (and the new flyer) and just ask people. What's the worst that could happen? Thank you for reading, and please let us know if you have any questions. Can't wait to see all of you at the gala! During the regular Thursday, February 14th morning coffee hour, college advisor, Kimberly Ge will provide information regarding college counseling and the college admission process for US colleges and universities, as well as be available to answer any questions. Event Time: 8:30 a.m. to 10:00 a.m. This year's theme is "Read Around the World." We are pleased to welcome award winning author Roni Schotter for an author visit on Thursday, March 7th for grades ES - 4. Thank you very much to the parents who have already signed up to help at this year's book fair. Please volunteer for an hour or more through SignUp Genius (LINK). It's a fun opportunity to support the English department. Grades ES - 4 will attend with their English classes, but all students and families are welcome (click here for the schedule). We will be open during parent teacher conferences on Tuesday, March 5th, so please stop by! Any questions? Please contact Karlyn Tabb (ktabb@gisny.org). 1) If you wish to have the photographers from Cool for School to retake your child's picture from October, please use the link below to sign them up. 2) If you have several children at school and would like to have the photographers take a sibling portrait, please also use the link below to sign them up. 1) Falls Sie wünschen, dass die Fotografen von Cool for School das Foto ihres Kindes vom Oktober nochmals machen, folgen Sie bitte dem unten stehenden Link. 2) Falls Sie mehrere Kinder an der GISNY haben und diese in einem gemeinsamen Geschwisterfoto (Sibling Photo) fotografiert haben wollen, folgen Sie bitte dem unten stehenden Link.